The development of Magic Realism in countries outside of Germany is complicated by the somewhat concurrent development of Surrealism. Some art critics and historians have failed to distinguish Magic Realism from Expressionism on the one hand, while others include many of its works as a part of Surrealism. Therefore a discussion of these movements is not possible without first defining what each of these movements represent, and how to they differ from each other. Surrealism was an organized movement in both art and literature, finding its impetus in "The Surrealist Manifesto", published by poet and art critic Andr?Breton in 1924. The purpose of this art was an approach to finds methods of uniting the conscious and subconscious realms of experience. The world of dream and fantasy would thus be joined with the everyday rational world in "an absolute reality, a surreality". The Surrealists often drew from the theories of Sigmund Freud, probing the subconscious mind as a wellspring of imagination. The Surrealists engaged in rather spirited, sometimes unharmonious, discussions as to how to tap the subconscious mind and manifest it in their works. Some Surrealists were interested in abnormal behaviors and sexuality. By contrast, the Magic Realists tended to view the world in terms of universals, rather than through introspection and self-analysis. They are more often observers of society and nature, rather than explorers of swiss replica watches depths of the subconscious mind. Both Surrealism and Magic Realism use a mixture of realism and fantastic elements. The main differences lay in the content itself. The objective of the Magic Realist is to bring us fresh presentation of the everyday world we live in. The artist may choose unusual points of view, mysterious juxtapositions or common objects presented in uncanny ways. However, everything we see is within the realm of the possible, although sometimes unlikely. Surrealism takes us to another world, one which is unreal and exists only in our mind. It presents the impossible, using both traditional and experimental artistic techniques, often shocking us. Surrealism as a formal movement developed in Europe mainly during the late 1920s and 1930s. A large number of painters in America followed its development with interest, but remained independent of the organized groups. With the outbreak of World War II, many European Surrealists fled to the Americas. However, they remained mostly isolated from American artists. The most important result of these immigrations was their influence on the development of Abstract Expressionism in the coming years. From the technical standpoint, the realistic effects of Magic Realism are achieved by a number of techniques. These include the thinning of oil media with turpentine or by using glazes. Several artists, including Otto Dix and Franz Radziwill adopted versions of the Mixed Technique, a method of oil painting dating back to the early Renaissance. 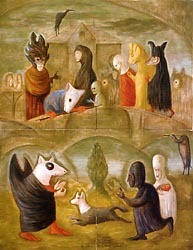 A number of American Magic Realists used egg tempera, a technique which dates back to the Middle Ages. Salvador Dali studied the techniques of the Old Masters in order to master the illusionary effects, so effective in his work. 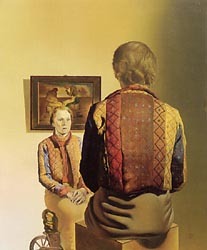 Yet most Surrealists used more contemporary painting techniques or even experimented with new ones, as was particularly the case with Max Ernst. In many Magic Realism paintings the emphasis is on the enhancement of objects within the subject matter, which helps create compelling dynamics and to strengthen remarkable illusions of reality. The difficulty for many art historians in distinguishing Magic Realism from Surrealism is that so many artists tended to cross back and forth between the two approaches. A number of the paintings by Salvador Dali and Rene Magritte are clearly Magic Realism pieces. The painting to the right is the Portrait of Gala from 1935. Dali executed a number of paintings in the Magic Realism style during the years of 1923-25. He also crossed between Surrealism and a faux neoclassical style, bordering on Magic Realism, several times later in life. Similarly the American artists Peter Blume and O. Louis Guglielmi crossed back and forth between approaches related to Surrealism and Magic Realism frequently during their careers. The inherent nature of Magic Realism art presents a major challenge for its practitioners. Magic Realism requires that the imagery be fresh and inventive. The artist must find ways to weave in fantastic elements, but while still maintaining an illusion of reality. The difficulty of doing this consistently is the main reason that for many artists only a portion of their oeuvre ends up being considered to be true Magic Realism, in some case only a single painting.